Yeti (or similar) Cooler - Worth it? Discussion in 'I Smell Something Cooking!' started by jaynine89, May 31, 2018. I have a question about these new Yeti coolers that I'm seeing more of. They're pretty darn expensive, but from what I've heard, they keep ice solid even in a hot vehicle for several days at a time. May need to drain out some water, and you'll probably have to add ice, but it won't be a complete puddle at the end of day one. I have a soft side Yeti and I love it. Take it to the beach and it stays iced all day. Sand just washes right off. I also have a metal can koozie and the 16oz cup and they work wonderfully. Still have ice in my cup from this morning and have refilled several times with water. I bought the softside when it was on sale buy one get one free at a black friday event when I was at The Lodge store in Pigeon Forge a couple years ago and split the cost with my FIL that made it a similar price to the Wal-Mart knockoff. My dad won a hard side in his Christmas raffle at work this year and it is incredible too. The knockoffs are almost as good on the coolers and if I wouldn't have got the deal likely would have bought one. I'm sure if I had one of each there would be things that I could point out that were better on the Yeti. I got an Ozark Trail knockoff cup that was hand painted for a Christmas present this year the same size as my Yeti. It does do a comparable job as the Yeti, but not as well. The main difference is the cheaper lid. I've used that cup less frequently and the lid already cracked. I also set my cigars on the lids if needed and the small amount of heat from the cigar melted the ozark lid and not the Yeti lid. The o-ring seal falls out of place and you have to fiddle fart with it when you refill. Minor stuff really. I have replaced the ozark trail lids with Yeti lids you can get online and it works better. Ultimately it's up to you whether the Yeti is worth more. I'm a bit younger and don't know what products were better made 25 years ago are still around now when their cheap knockoffs have long since been thrown away. I envision the difference between the two as by paying more now you have a product still going strong and is sought after as a collectible 20-30 years from now vs. the knockoff you'd have replaced a few times in that same timeframe. I bought a Leatherman utility knife vs. the cheaper knockoffs for the same reason. This is something that hopefully when my kids are dividing up my stuff that they'll say I want the Leatherman/Yeti while the ozark trail cup will likely hit the trashcan. Most of the time we stock up on our frozen meals at a WALMART store close to the destination and these all go into into the Colman 5-day cooler. Things that we don't want to get water soaked goes into the plastic box with closed lid. After the hurricane last year in Florida my neighbor brought home a Yeti cooler from his restaurant. Everyone was amazed at how it still had ice 6 days after the storm. My 150 gallon igloo marine cooler had just as much left. I'm sure they are better for longer periods but for what I need, my 65 dollar igloo serves the purpose. No way I would ever spend that kind of money on a cooler. BelchFire and Orchid like this. Yeti's are good for Bear country otherwise get a Coleman 5 day extreme. I still have ice leftover from last weekend. I use a regular cooler and made a cover for it out of refeltix, I have kept ice for 6 days on a solo canoe trip. crazymama30 and BelchFire like this. I looked at those, but was put off by the weight. The Yeti Tundra 45 weights 28.5 lbs empty. Fill it up with food and ice and you have got a pretty darn heavy cooler. 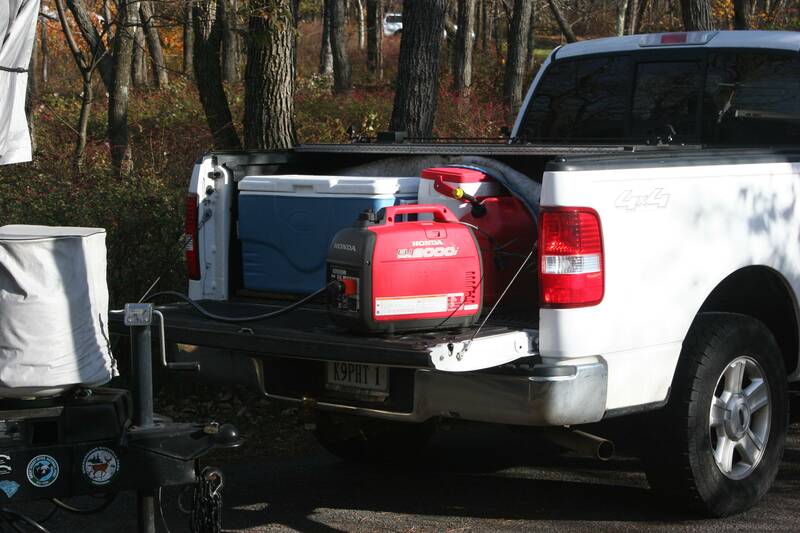 I use two Coleman metal sided coolers and I fill one with just ice and keep it in the back of the SUV under a cover. Then, when the other cooler with the food and drinks gets low on ice, I can add some from the ice cooler. Since the ice cooler is not getting opened and closed all day the ice lasts a long time. I also got the Coleman 5 day. I put reflectix around the cooler and a reflectix top insert for the inside of the cooler and got ice to last 4 days even in a 100 + degree car. Personally I couldn't see paying the $300+ my stores are asking for for a yeti. As long as you don't open and shut the cooler three + times a day ice could last a pretty good time. I personally only open it once a day, take the days worth of meals out and put it in the fridge in the camper or put in the drink cooler. That way the ice lasts longer in the main cooler. I sometimes don't even bother with a drink cooler on my short trips. I'm a water drinker anyway and bring that in my 5 gallon jug from home. I won’t buy a yeti anything. I assume that if I did, I would have to put a sticker on my truck and brag to everyone about how awesome it is. Fbird, chambo, Kampus and 4 others like this. We used classic Colman metal coolers for years, with stacked foam pads on top and a jacket made of Reflectix or the one from PUGs. In our climate, the metal can get too hot to touch, even under a cargo cover. When the last metal one began to crack, we first went to a Canyon cooler - higher efficiency, not as pricey as the Yeti. Worked pretty well, but we still ended up using the foam and a Reflectix cap. That cut down our ice usage, especially after the first day or so when it was really chilling and shaking down). When we bought the TT, which has a good 'fridge, we bought a Pelican. Outer dimensions are about the same as the Canyon, but it has a bit smaller capacity, and on most trips, we can restock ice just a time or two over a week. The cooler is now used mostly for beverages, lunch when we're away from camp, and restocking on longer trips. I've found that the "Extreme" type coolers are really good. Probably not as good as a Yeti. But good enough to not get a Yeti. jnc, megcabra and bearman512 like this. Aldi has a yeti clone for $80. I don't have one. The thing I liked the most about that style of cooler is the latch system. I have a decent 5 day cooler now but it has no latch. Truth be told though I am hoping for a good deal on a 12v freezer like an ARB. Check out what Aldi in Burlington North Carolina is clearanceing them at! For the price of a Yeti, may as well buy a 12v fridge. Though I assumed that most rotationally molded coolers would be fairly equal with regard to thermal efficiency (one did arise as the clear leader), I was surprised at how well the Coleman Xtreme Wheeled 50 and Igloo MaxCold did in comparison. While they lack the rugged construction of the premium coolers, they were both within 36 hours of the best rotomolded unit when it came to ice retention/melt. Not bad when considering their low price. I though about the Yeti but I ended up with the 58 quart Marine Extreme. Under extreme conditions, it uses about 5 lbs of ice a day so it can last for many days (I used it for several months at a time). The Marine Colemans have better handles than the regular Colemans and cost a little more but they have two advantages over the Yeti: price and weight. Once the cooler is full of ice and food it can be very heavy. Heft a Yeti and you can see it is really heavy - not worth it to me. We bought this Lifetime cooler and tried it out over the Memorial holiday. It did great and had ice still in it after 4 days. A lot cheaper than a Yeti. They even have a flyer on the side of it comparing it to other brands including the Yeti and how it holds up the same or better on ice consumption.